There are 16 posts tagged Bonn (this is page 1 of 2). In December 2013, UN climate negotiators agreed the Warsaw Framework for REDD plus. This included a decision on summary of information on safeguards. At the time I described this decision as staggeringly weak. The decision reached in Bonn earlier this month, manages to make the text even weaker. 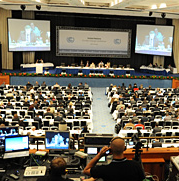 The Bonn climate talks in May 2012 were the first negotiations under the Durban Platform, agreed at the Conference of Polluters in December 2011. A recent report by Kate Dooley of FERN outlines how the talks on REDD in Bonn developed. A group of Brazilian NGOs has written to the Brazilian delegation for climate change negotiations, opposing offset and market mechanism as a means of financing REDD. The letter is signed by 21 environmental organisations and social movements and is available below in English and Portuguese. 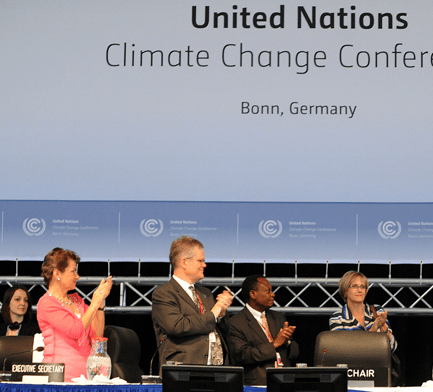 The latest round of UN climate meetings is currently taking place in Bonn, Germany. REDD is on the agenda in several parts of the meeting. Here is REDD-Monitor’s attempt to explain what is on the agenda regarding REDD during the meetings in Bonn over the next two weeks. In Greek mythologoy, the hydra was a serpent with seven heads. When one head was cut off, it grew two more. It was so poisonous that even its breath was deadly. At the start of last week’s UN climate negotiations in Bonn, Yvo de Boer, the UNFCCC Executive Secretary, described the negotiating text as “200 pages of incomprehensible nonsense”. By the end of the week, de Boer wasn’t much more optimistic. “We seem to be afloat on a sea of brackets,” he was reported as saying in the New York Times. By the end of the UN negotiations in June in Bonn, the negotiating text had expanded from 50 pages to 200 pages. For those of you who like your square brackets, curly brackets and brackets within brackets within brackets, it’s a particular treat. The REDD section of the document is 20 pages long. But what actually happened during the negotiations and what do we need to look out for in the lead up to Copenhagen? Halt climate change. Halt forest destruction. Halt plantations. On Monday, 8 June 2009, protesters gave delegates arriving to the climate negotiations in Bonn a simple message: “Halt climate change. Halt forest destruction. Halt plantations.” Compared to the mind-numbingly complex negotiations inside the Maritim Hotel, it was nice to have a clear vision of what the talks should be about. In a side event at the UN climate negotiations in Bonn, Patrick Alley of Global Witness highlighted the dangers of REDD – as well as the potential opportunities. We know what The Nature Conservancy thinks about forest offsets. It loves them. It loves them so much that it has got into bed with the biggest coal-burner in the US, American Electric Power. Meanwhile, TNC has developed a “global mechanism proposal”, which includes a goal of 3 billion tons of “emissions reductions from REDD” by 2020.